TALES OF POE is based on three classic tales from Edgar Allan Poe and stars many familiar faces. So without further ado let us begin our journey through these works as brought to us by directors Bart Mastronardi and Alan Rowe Kelly. Chapter 1: The Tell Tale Heart - Debbie Rochon plays a nurse looking after a retired silent film star who has an eye that drives Rochon's character mad. Soon she can't take the eye no more and kills the lady in her sleep burying her body under the floorboards. The police come knocking being made aware of a scream in the night by a neighbour. The policeman looks over the house and sees nothing odd except Rochon's odd behaviour. Her madness gets the better of her and she rips up the floorboards revealing the dead body and goes ahead ripping what she believes is the still beating heart out of the ladies body. This story is played out by Rochon in a mental asylum recalling her story to other inmates who get a bit more then they can chew when they call her on her story. Chapter 2: The Cask - A winemaker gets married to his lover but soon finds that his new betrothed is actually been trying to kill him. Failing on this, she along with her lover chains her new husband to a wall and bricks him up then throws a match on him for good measure. Feeling that she will get away with everything and is now richer then she can ever imagine she has a new problem, the lover wants his share of the money too. This doesn't sit well so she kills him off as well but soon the person who she thought she had killed comes back and has one thing on his mind...revenge. Chapter 3: Dreams - This chapter is the dullest of the lot as it meanders on for far too long not really going anywhere. It does have a stunning look to it and stars Amy Steel, Adrienne King and Caroline Williams but even they can't save it. The plot seems to follow a young girl simply known as Dreamer as she goes further down the rabbit hole and becomes further entangled in strange meetings with people in her dreams. It is a bit of an odd one to have the film bow out on as unfortunately this last chapter sticks in your mind and not in a good way. A strong opening is followed by an even stronger second story only to be let down by the final story. That isn't to say that as a whole the film is a failure because it is not. Those who are familiar with Edgar Allan Poe's work will enjoy these new spins on some of his more popular work. The scripts for each part are well done and performed well by all and it is always nice to see some scream queens from the past make an appearance. The music has an overall sense of suspense that works throughout with the subject matter. 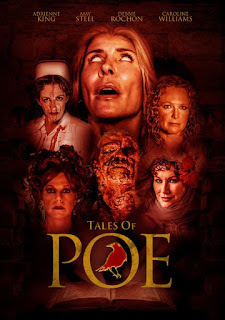 If you don't fancy picking up an Edgar Allan Poe book and seeing how well crafted his work is you couldn't do any better then picking up this film and immersing yourself in the world of TALES OF POE.